The County Clerk-Auditor-Recorder is an elective office for which the department consists of four divisions: the Click to go directly to County Clerk PageCounty Clerk, Click to go directly to Auditor PageAuditing, Click to go directly to Recorder PageRecorder and Click to go directly to Elections Information PageElection Division. 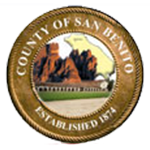 The staff provides a number of services for the residents of San Benito County. Our mission is to serve San Benito County by providing extraordinary customer service when assisting the public. This includes being on the leading edge of operational best practices as well as further improving and increasing the knowledge and skills among staff for a more positive form of customer service.